The theme of this year’s Clifden Arts Festival will explore the concept of “home” as well as showcasing Ireland’s diverse and artistic culture through compelling events which promise to enchant and educate people of all ages. Brendan Flynn, Festival Director explained ‘The physical place of birth holds a special place within us, while for others it isn’t physical but rather the feelings, the emotion, the character, the people and the culture, that shape it and make it. We hope to capture that feeling and explore a sense of home and how it is unique for each of us’. The line-up at this year’s Clifden Arts Festival is very strong with a handful of names that would have headlined at much larger events over the years. This festival in the heart of Connemara had humble beginnings when it was conceived 41 years ago by a small community committee who wanted to give local artists a public platform and provide a small programme of cultural events. It has of course gone from strength to strength and has indeed made its mark on the annual calendar of festivals around the country with over 11,000 expected to attend the various events. A mixture of traditional, classical and C&W as well as contemporary music is on the menu among the 200 events over the twelve day festival which will take place in a number of venues and around Clifden. Among those events are poetry and prose readings, art exhibitions, book launches, theatre and talks. The RTE Concert Orchestra and RTE’s Contempo Quartet both make the journey to Clifden this year. Other big names in Irish music performing at the festival are Aslan, Máirtin O’Connor, Maighread Ní Dhomnaill, Martin Hayes, Bill Whelan, Lisa Hannigan, Declan Nerney, Frankie Gavin and Fiachra O’Regan, Seán Keane, Charlie McGettigan, Andy Irvine, Donal Lunny and Paddy Glackin to mention a few. Aosdana members, Paul Durcan and Rita Ann Higgins will give poetry readings and new novelist, E.M. Reapy, a Mayo native, whose novel Red Dirt is set in Australia, gives a reading alongside Sligo born Galway based, Michael Gorman. The literary line up is varied and rich with Food for Thought, a talk by former editor at Country Living magazine in the UK, Margaret Hickey and Connemara based food writer and photographer for The Sunday Times -Cliodhna Prendergast. Fergal Keane, journalist and author will also provide give an insight into his work as a foreign correspondent for the BBC, reporting on issues including the conflict in Northern Ireland, the end of apartheid in South Africa, and the Rwandan genocide, his talk is titled wounds: a memoir of war and love. The Long-Lost Short Stories of Gearóid P. Mannion is a another gem ,hidden in a cupboard under the sink for over a quarter of a century lay a collection of essays long forgotten. Enter the world of a precocious teenager growing up in 1980s rural Ireland. These stories are made all the more poignant because their author, in spite of having a life-limiting illness, illuminates his incredible mind. Gearóid P. Mannion passed away at 21 but his legacy lives on in this funny, heartfelt, warm collection of essays written when he was a teenager, the reading will be by his sisters Karen and Sinead Mannion. There’s a one man play, ‘Padraig Potts’ by Séamus O’Rourke and there’s a monologue about Constance Markievicz written by journalist Mary Kenny and performed by Jeananne Crowley. If you want to hit a funny bone, fresh from his tour at the Edinburgh Fringe, award winning comedian Danny O’ Brien his ‘best of ‘ show to Clifden. The visual arts programme will showcase a major exhibition by Irish artist Brian Maguire. The exhibition brings together Maguire’s latest body of work from his visit to Syria in 2017. The Aleppo Paintings document the ruined buildings of the city, offering a visceral and stark insight into the physical consequences of war and the international arms trade that fuels all conflict. Maguire’s approach has led him into settings usually regarded as remote from the rarefied domain of the art world, the result of which is an emotionally evocative exhibition. 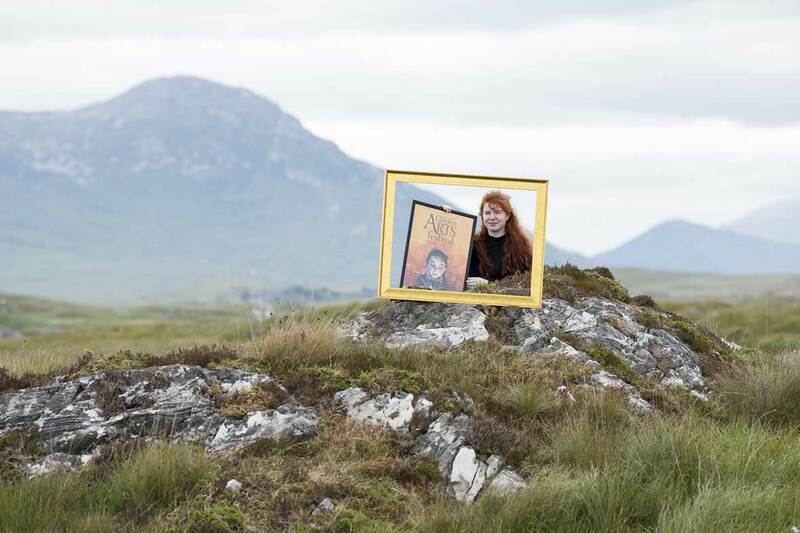 Highlights of the visual arts programme also include exhibitions from internationally renowned Mick O’Dea, the current President of the Royal Hibernian Academy (RHA), as well a spectacular collection from the acclaimed Connemara based Dorothy Cross. There’s loads to do and see for family entertainment, like Fidget Feet’s spectacular acrobatics, free activities and workshops. Fidget Feet are a pint-sized aerial circus company from Ireland. They tell stories from anywhere they can think of; from cranes, forests, or swinging from buildings. In recent years the Festival Finale has established itself as one of the must-see events. The festival kicks off on September 12 and continues daily until September 23. Image: Hetty Lawlor pictured launching the 2018 Clifden Arts Festival (programme of events). Hetty recently took part in the Sky Arts Portrait Artist of the Year competition, where she became the youngest artist to make it to the final of the show and was announced as the overall winner of the Texaco Children’s Art Competition. She’s not the only artist in the family – her father Jimmy is an artist and has designed posters for The Clifden Arts Festival throughout the years, with his distinct style.